Get ready to enter a fifth dimension of high-definition video entertainment, one that lies between the pit of man's fears and the summit of his knowledge... a dimension of imagination that could well prove one of the most exciting home entertainment releases of the year. One of the most iconic and celebrated TV shows of all time, The Twilight Zone, is coming to DVD and, for the first time ever in the UK, to Blu-ray. Over the course of 2011, Shock Entertainment and FremantleMedia Enterprises will be releasing all five complete seasons of the series (originally broadcast between 1959 and 1964) plus the complete 1980s revival series. Created by the legendary Rod Serling, the multi-Emmy award-winning The Twilight Zone was a true landmark show in television history. It made an indelible mark on popular culture and remains, to this day, one of the most innovative and influential series of all time. The original series ran for 156 episodes between 1959 and 1964, spawning a revival series (1985-1989), a Steven Spielberg-produced feature film (1983), a TV movie (1994) and a final TV series (2002-2003). Sophisticated and entertaining, much of the show's success was due to the timeless nature and universal appeal of its stories. Its writers included leading sci-fi and fantasy genre writers Richard Matheson, Ray Bradbury, Charles Beaumont and Serling, himself. The series also helped launch the careers of many soon-to-be famous stars, including Charles Bronson, James Coburn, Robert Duvall, Peter Falk, Dennis Hopper, Ron Howard, Lee Marvin, Vera Miles, Elizabeth Montgomery, Agnes Moorehead, Leonard Nimoy, Donald Pleasence, Robert Redford, William Shatner and Natalie Trundy, as well as providing a platform for established acting greats such as Buster Keaton, Burgess Meredith and Mickey Rooney. Over the years, The Twilight Zone has been acknowledged as an influence by countless writers and filmmakers, including Steven Spielberg ("I was a complete obsessive-compulsive Twilight Zone follower"), J.J. Abrams ("The Twilight Zone at its best is better than anything else I've ever seen on television"), Joe Dante, John Landis, Wes Craven, George Miller, Clive Barker, Steven King and Michael J. Straczynski. Presented for the first time in the UK, the Blu-ray edition is in pristine high-definition, digitally remastered from new 1080p film transfers using the original camera negatives and magnetic soundtracks. As well as all the features on the DVD editions, the Blu-ray editions will also include a host of extras, available for the first time in the UK. Season 1 alone includes an unofficial pilot written by Rod Serling, 19 new audio commentaries, 18 radio dramas, 34 isolated music scores, and much more. The Twilight Zone: The Original Series – Season 1 (cert. tbc) will be released on DVD (£34.99) and Blu-ray (£49.99) by Shock Entertainment and Fremantle Media Enterprises on 18th April 2011. UPDATE: The release date has now been changed to 2nd May 2011. The Twilight Zone Comic Book (pdf format), an issue of the popular comic from 1963. 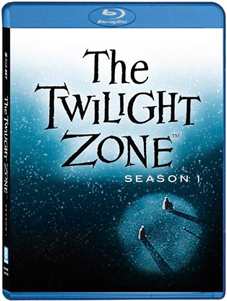 The Twilight Zone: Season Two will be released on DVD and Blu-ray on 23rd May, Season Three on 27th June, Season Four on 8th August and Season Five on 19th September 2011. Complete boxed sets of the original series and the 1980s series will be released on DVD only on 31st October 2011.